OK, this is getting ridiculous--the third major collapse of this season, and this time, apparently and tragically, it was fatal. In the radar you can clearly see a massive northeast-southwest front coming across the state from west to east, and once again it shows gust fronts or outflow boundaries out in front of the storm, which often indicate high winds, as I explained in the last posting. Anyone with some weather knowledge watching the radar would likely have seen this--in the third loop in the video I point out the gust fronts with the mouse in this low res (Level III) radar archive. 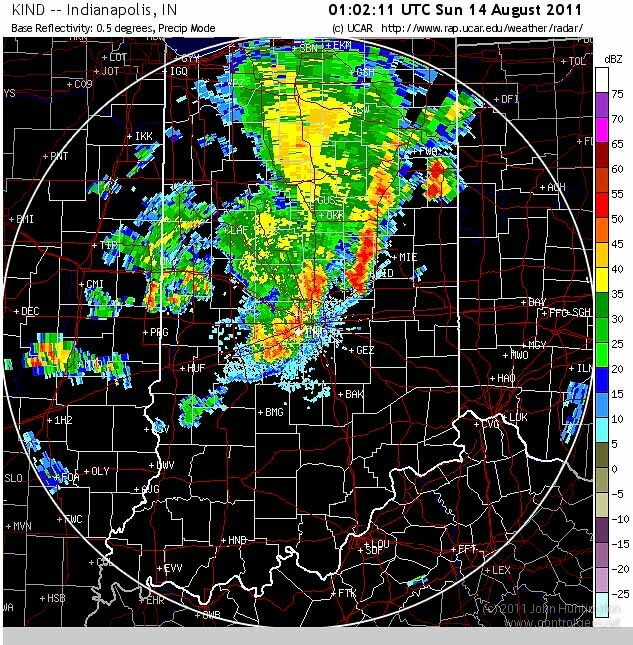 Jesse Ferrell of Accuweather has a good write up on the storm with better radar imagery and a higher-res loop here. Backstage, State Police special operations commander Brad Weaver was watching an ugly storm moving in on radar via his smartphone. He and fair Executive Director Cindy Hoye decided it was time to evacuate the crowd. But a minute later, when WLHK program director Bob Richards addressed the crowd, the word was that the show would go on, and that the crowd should be prepared to find shelter if things changed. Some of the crowd sensed the danger and left without further word. But the majority remained. Roger Edwards talks on his blog today about the tragedy and links to a 2002 paper he wrote with Leslie R. Lemon while working at the Storm Prediction Center. It's titled, " PROACTIVE OR REACTIVE: THE SEVERE STORM THREAT TO LARGE EVENT VENUE"
The NY Times is reporting that the stage came from Mid-America Sound in Indiana. Pictures of the stages they rent here. Keep in mind that as the storm chaser was shooting this video, he had no idea of the tragedy about to unfold, which accounts for his excitement. Via JimOnLight, comes a time line from WANE.com. Wow, same storm, different venue, very different action: The Indianapolis Symphony was playing at Conner Prarie Interactive History Park, and there, the show was cancelled before the same storm front arrived, according to IndyStar. Bill Gorlin of McClaren Engineering has a commentary up on Live Design which links back to an article on wind loads on outdoor stages he wrote back in 2008. Severe weather expert Jon Davies (who I've heard speak at the National Storm Chaser Convention several occasions) has a great write up on his blog today, with pictures pointing out the gust front. Another excellent radar analysis, with detailed Level II radar much better than what I have above here from Brad Panovich. I talked about this horrible tragedy on the Weatherbrains podcast, and for further updates, see my followup about fair management here.